Alright, this was super fun and I was so happy every time I got an entry! I’m so glad it went over well with everyone. I adore this costume. We all had a lot of similar thoughts for Oscar, who is pretty much an honorary mouse himself. N.Y.E.S. had a take on the mousie costume with an emphasis on found materials and Oscar’s own talent for sewing. I’m sure he will be hard pressed to put this one away after the candy hunt is over, since it looks so warm and cozy. 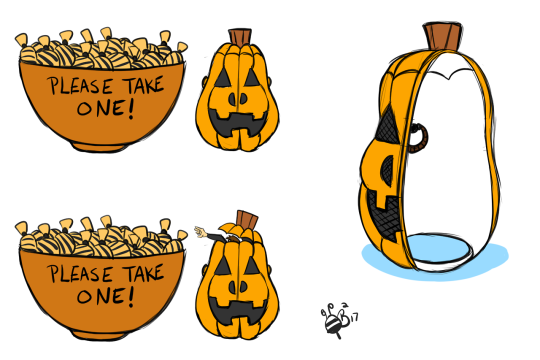 @therealbrigeedarocks / @thebrigeedadraws, with Nobody Suspects the Gourd! Dang, guys. This one was heckin’ creative, was it not? 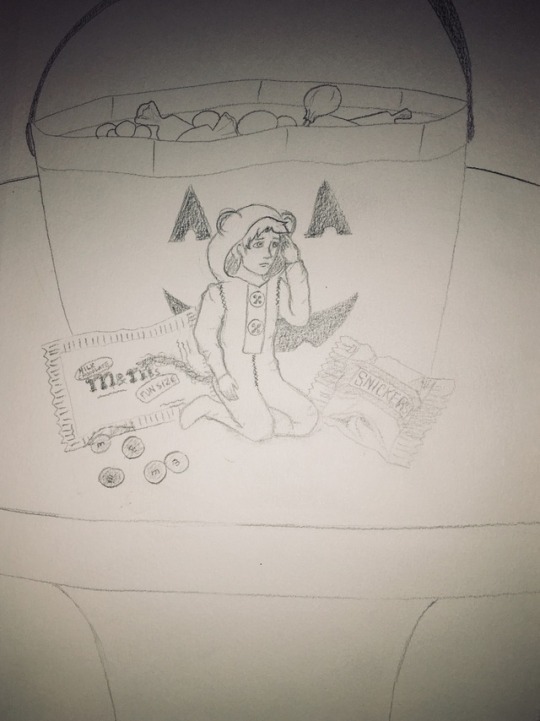 The thought of Oscar putting something like this together so he can sneak candy and also effectively flee with said candy is super entertaining, and I love it. He is a clever little guy. I like how Bee called back to a not-often-seen side of Oscar: that he loves holiday decorations and stuff like that. Why not just be one for halloween? Gets him some candy! “Um, what’s Hollowbean?” Oscar said, speaking up. “Candy sounds nice, but I don’t think I would like going to people’s houses.” It did sound like fun, but Oscar wasn’t too keen on any other humans seeing him. He didn’t think other people would be as nice as Dean. “And I can always get us some candy from the gas station,” Dean said. There is one knight in the Knight’s Inn motel, and that knight is timid little Oscar. Torch wrote a very cute and very in-character piece detailing Oscar donning some aluminum-foil armor, complete with a helmet that doesn’t quite fit (maybe he’ll grow into it someday). I really love the image it put in my head of the tiniest little guy holding up his toothpick sword, ready to slay dragons and rescue princesses and candy!